Jewish students are a unique minority in the collegiate world. Their identities, while grounded in a living faith, also revolve around an ancient cultural heritage with historical and geopolitical considerations that remain relevant. Perhaps the overriding attribute of Jewish identity is the emphasis on supporting their community, regardless of the scale. For many incoming Jewish freshmen, the presence of a Jewish student body on-campus is as crucial as the general academic and social merits of the institution. Such communities offer a unique source of support, providing a place to worship, Kosher meals and faith-backed extracurriculars. Students who identify more as cultural Jews, and less as worshippers of the faith, may also care about these sorts of community efforts. The Jewish-student experience found at a school will of course vary student to student. Some may seek out Jewish Greek life, while others immerse themselves in a school's Hillel chapter. Some students pursue Jewish studies as a major or minor, while others spend their college years parallel to a school's Jewish community, but nonetheless appreciative of its presence. 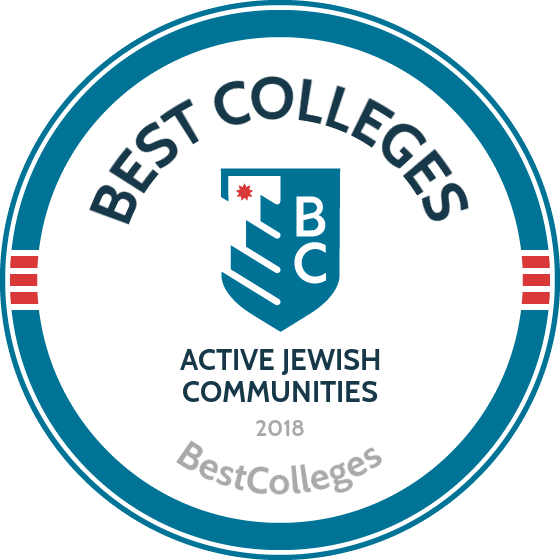 In the spirit of helping students identify and enliven Jewish communities in the higher education system, we've identified 50 schools that best represent academic excellence and a strong on-campus Jewish presence. When ranking schools, we first employed our general methodology to create a list ordered by academics alone. From there, our editorial team personally examined each school to determine the quality of the Jewish student experience offered and then readjusted the raw rankings. Schools with their own dedicated Hillel, informal and formal Jewish extracurriculars, a strong history of religious tolerance and sizable Jewish student populations were given greater weight in the rankings. Ranked the No. 1 best college by the U.S. News and World Report, the fourth-oldest college in the U.S. is renowned worldwide for its prestigious academics. As a top research university, Princeton offers degrees in social sciences, natural sciences, humanities and engineering. Princeton's active Hillel, or Center for Jewish Life, provides Jewish students opportunities to participate in religious studies through ongoing series, classes, lectures, fellowships and travel. Hillel at Princeton coordinates service-learning trips for students looking for alternative spring breaks and cultural exchanges. There are also several student groups, including Koleinu, a Jewish a cappella group; LGBTQ*J, which welcomes LGBTQ students at Hillel; and a networking group for grad students called Jewish Graduate Students and Young Professionals. Yale Hillel, also known as the Joseph Slifka Center for Jewish Life, serves as a place for students to explore their Jewish identities during their college years. Hillel-affiliated student organizations include Jews for Justice, a group committed to pursuing social and economic justice at Yale; Magevet, a Jewish a cappella group; and Jews and Muslims at Yale, which aims to create a haven for dialogues on Jewish and Muslim issues. In addition, the Jewish Students Association invites students from the Yale School of Management to participate in activities. With more than 375 years of experience in educating students, Harvard is known for its stellar academics. The university is made up of Harvard College, several graduate schools and a library system with the oldest collection in the United States. Harvard's Center for Jewish Studies was established in 1978 and is a venue for continuing studies of Judaica via lectures, symposia, publications and fellowships. Student-run groups include the Harvard College Progressive Jewish Alliance for progressive Jews and their allies to discuss political issues in the U.S. and around the world, and the Harvard College Bagels, which is dedicated to promoting visibility of queer/Jewish people. The Harvard Business School also hosts the Jewish Students Association to support the Jewish community on its campus. Situated between San Francisco and San Jose, Stanford University is in the epicenter of California's Silicon Valley. Both the Rohr Chabad House at Stanford and the Hillel at Stanford provide places for students to explore their heritage and Jewish identity. Stanford hosts a number of groups for Jewish students, including the JQ (Jewish queers); the Jewish Student Association; J Street U, which discusses peace, security and social justice issues; and TAMID Investment Group, which connects students interested in business with economic ventures in Israel. The Jewish Law Students Association also promotes a Jewish community within the Stanford Law School. Dartmouth College, a private Ivy League school, is known for its high research activity and is home to the highly ranked Tuck School of Business and Thayer School of Engineering. The Big Green's Hillel, also known as the Roth Center for Jewish Life, facilitates a multitude of programs and events for Jewish students. Weekly Hillel activities include Jews and Java, Shabbat services and dinner. The Roth Center also supports the Jew Crew for Dartmouth freshman, which serves as an introduction to life at Hillel, and Challah for a Cause, a group that bakes challah for a local homeless shelter. In addition, the Roth Center organizes international trips for students who wish to participate in Birthright or service learning projects. University of Chicago is a leading academic and research institution situated in urban Hyde Park. Hillel at the University of Chicago serves as the school's hub for its Jewish community, however there are a number of undergraduate and graduate programs with a focus on Jewish student life. For undergraduates, there is the Chicago Rhythm and Jews, a Jewish a cappella group; J Street UChicago, an advocacy group organized for peace, security and social justice in Israel; and Makom, a journal of Jewish thought. Graduate programs include associations for Jewish students in the law, medical, public policy and business schools. Known for its emphasis on science and technology education, MIT's five graduate schools and undergraduate college include the highly ranked School of Engineering. MIT Hillel offers a range of programs that provide a platform for students to explore Jewish culture and tradition. In addition to Jewish-centered Greek life and student groups organized around events connected to Israel, MIT offers cultural and social clubs such as Techiya, a Jewish a cappella group, and the Kosher Food Club. Catering to grad students, Grad Hillel is an association of Jewish MIT graduate students and young professionals from the surrounding Cambridge community. With Jewish students accounting for more than 10% of the undergraduate and graduate population at Duke, the school provides plenty of programs and initiatives dedicated to its Jewish community, including Jewish and Israeli career services, mentoring, fellowships and LGBT resources. The Freeman Center for Jewish Life houses the department for Jewish Life at Duke and the Rubenstein-Silvers Hillel. Student-run groups include Duke Friends of Israel, Jewish Business Association and J Street U at Duke, which is a part of a national student advocacy effort to promote peace in Israel. Aiming to continue in the entrepreneurial and creative spirit of its founder Benjamin Franklin, the University of Pennsylvania has been consistently ranked among the top 10 universities in the U.S. Reaching more than 2,200 Jewish students, Penn Hillel serves as the umbrella organization for UPenn activities and events for Jewish students. There are a myriad of student-run groups affiliated with Hillel that are focused on exploring the Jewish faith and culture. Three separate groups are dedicated to UPenn's conservative, orthodox and reform Jewish communities. Others include the Jewish a cappella group Shabbatones; J-BaGel, which promotes the LGBTQAI campus community; and the Jewish Renaissance Project, a forum for discussing Jewish identities. Headquartered on Broadway in Manhattan, Columbia is the oldest university in the state of New York. The undergraduate program consists of three schools: Columbia College, The Fu Foundation School of Engineering and Applied Sciences and the School of General Studies. The Columbia/Barnard Hillel is the center for Jewish student life at both Columbia University and Barnard College. Affiliated student groups are focused on Jewish culture, education, social justice and topics pertaining to Israel. Jewish students enrolled in Columbia can participate in Yiddish Club, a variety of educational seminars and Shalhevet, an Israeli-inspired dance group. Located outside of Los Angeles, Pomona College, a small liberal arts school, boasts a low teacher-student ratio and the chance for students to work directly with faculty. As a member of The Claremont Colleges, Jewish students at Pomona College are welcomed at Hillel at the Claremont Colleges. Along with weekly Shabbat dinners, Hillel at the Claremont Colleges offers cultural, educational and social action programs for its Jewish student community. Additionally, Claremont Hillel hosts Birthright trips to Israel for students seeking to explore Israel and Jewish history and tradition. Ranked the no. 2 national liberal arts college by U.S. New and World Report, Amherst is part of a five-college consortium that provides students with access to a wide array of local courses, resources and lectures. Hillel at Amherst College is the center for Amherst's Jewish students, which make up about 10% of the population. Along with Shabbat and holiday dinners, Hillel hosts political discussions, social gatherings and group trips. Amherst students interested in additional morning services are within walking distance of synagogues at UMass Hillel and the Jewish Community of Amherst. On campus, the Chai Society aims to connect the Jewish student body with its heritage. Established 250 years ago, Brown University is an Ivy League school and a premier research institute. Students at Brown are encouraged to create their own course of study from renowned multidisciplinary programs. Situated near Brown and the Rhode Island School of Design, the Brown RISD Hillel operates as a place for the Jewish community on College Hill. With social events, service projects, lectures and forums, the Brown RISD Hillel is more than simply a religious organization. Among its affiliated student groups are Hillel-o-l, a Jewish comedy group; the Jewish Cooking Club, which celebrates Jewish foods and culture; and Mahberet, a Jewish literary magazine that publishes work by Brown and RISD students. Williams College, nestled in the Berkshire Mountains in Massachusetts, is a private liberal arts school. The faculty to student ratio is 1:7. Just about 10% of the student body at Williams identifies as Jewish. The Hillel-affiliated organization on campus is known as the Williams College Jewish Association, and it serves as a space to foster a strong Jewish community. The group's activities include holiday parties, interfaith gatherings, lectures and academic discussions. The Jewish Religious Center houses the Williams College Jewish Association and operates as a place for religious observances and social gatherings. Committed to providing a true liberal arts education, Carleton College's range of 37 majors and 15 concentrations are the foundation for curricula that encourages students to the master the art of learning. JSC, Jewish Students of Carleton, acts as the on-campus Hillel and holds weekly Shabbat dinners and holiday celebrations. As an organization, JSC promotes programs focused on the politics and culture of Israel. Throughout the year, the group hosts enrichment sessions, such as an informal Torah study and the Jewish Thought Reading Group, which brings together students and faculty to discuss pertinent works. With funding provided by the Carleton Student Senate, the group also coordinates game and movie nights and sporting events. Founded in 1873 by Cornelius Vanderbilt with the mission to create a school that would strengthen ties between all sections of society, Vanderbilt is a private research school with academics that span from management to music. For the approximately 1,000 Jewish Vandy students – or between 15 and 18% in a given year – Vanderbilt Hillel coordinates everything from Friday Shabbat dinners to social events like alternative spring breaks and pizza parties. Hillel supports several Israeli advocacy groups, including Dores for Israel, which holds political discussions with professors and brings Israeli culture to campus. Graduate students have additional programming, like Jmingle, a social scene for Jewish 20- and 30-year-olds at Vanderbilt and the surrounding Nashville area. Harvey Mudd is a liberal arts school that specializes in science, math and engineering. The small, private institution is part of the Claremont Colleges, a consortium of five undergraduate schools. As part of the consortium, Harvey Mudd students have access to Hillel at the Claremont Colleges. Students are eligible to join the Jewish Student Union and participate in the Jewish Mentor Program, which provides students with the opportunity to explore their Jewish identities. Through programs like the Hanukkah Fried Food Fest and road trips to JEWLICIOUS, Jewish students at Harvey Mudd have plenty of opportunities to join social get-togethers at the shared Claremont Hillel. In a Chicago suburb near Lake Michigan, Northwestern University is home to more than 17,000 students enrolled in 12 different schools and colleges, including the notable Kellogg School of Management and Feinberg School of Medicine. While the Fiedler Hillel is the hub for Jewish life on NU campuses, there are many additional student groups aimed at organizing Jewish students for social, cultural and political events. The Jewish Theatre Ensemble creates a conversation about Judaism through theater, and NUJOT aims to bring together a Jewish graduate community. A popular program at Fiedler Hillel is presented by its Speakers Committee and, in the past, has brought in guests like Sarah Silverman and Andy Samberg for entertainment. Neighboring downtown St. Louis, Washington University is sprawled over 169 acres in a suburban setting. Among its seven academic divisions is the No. 1 ranked Brown School of Social Work and Public Health. With Jewish students comprising about one-third of the undergraduate population, it's no surprise one of the largest organizations on campus is the St. Louis Hillel. Programming at the Hillel reflects students' interests, and focuses on four main areas: religious life, culture and education, social gatherings and social justice. Student organizations affiliated with the St. Louis Hillel include WIPAC, a group working to strengthen the U.S.-Israel relationship by connecting with political leaders, and Staam, the only co-ed Jewish a cappella group at Wash U.
Swarthmore College, founded in 1864 by Quakers, offers an engineering and liberal arts curriculum on a campus situated just outside of Philadelphia. Swarthmore is part of the Tri-College Consortium and shares resources with Bryn Mawr and Haverford. Founded on principles of inclusion and diversity, Jewish students at Swarthmore will find a home-away-from-home in the Chabad House and Swarthmore Hillel. Events organized by Chabad House and Hillel include lunch & learns, group discussions, Jewish mysticism classes, and dinners and holiday celebrations cooked up in Swarthmore's Kosher kitchen. In addition, a group called Swarthmore Rosh Chodesh caters specifically to Jewish women who wish to explore their religious and spiritual identities. At about 1,800 undergraduates, Bowdoin is a small institution dedicated to providing a well-rounded liberal arts education to awaken minds and cultivate imaginations. With no synagogue in Brunswick, Bowdoin Hillel serves to support students by holding services and act as a meeting place for the greater Jewish community. The organization offers weekly Shabbat dinners with student-led services and candle-lighting, among other holiday celebrations and gatherings. Through its Spindel Lectures, Bowdoin Hillel has hosted past guests that include Peter Cole, a poet and Yale fellow, and Allegra Goodman, an author who discussed the life of a Jewish writer. Situated in urban Houston, Rice is not only known for its premier academics, but also its 14 varsity NCAA Division I athletic teams. Serving as a platform for Jewish students to embrace and explore their Jewish identity, Houston Hillel offers Shabbat dinners and social gatherings like the popular open mic night known as Biet Café. Rice Hillel is part of the larger Houston Hillel, which welcomes students from Rice, Sam Houston State University, Texas A&M Galveston and young professionals in the Houston area. Rice students enrolled in Jewish studies courses can also benefit from the Jewish Studies Student Association, which organizes academic panels, movie showings and study breaks. Johns Hopkins University, America's first research university, is a private institution with exploration and discovery at its core. Students can choose from more than 50 majors across humanities, social sciences, natural sciences and engineering disciplines. Hopkins Hillel, which is Baltimore's first Hillel, offers the school's approximately 600 Jewish students – or 13% of undergraduates – the opportunity for involvement in Hopkins Jewish life. In addition, student groups like Ketzev, a Jewish a cappella group, and the Coalition of Hopkins Activists for Israel (CHAI) provide just a small slice of Jewish-focused activities on campus. With campuses throughout greater Boston, Tufts University has 10 separate schools for undergraduate and graduate students, including the reputable Tufts School of Dental Medicine. Jewish students at Tufts can join in weekly gatherings and social events at both the Rohr Chabad House and Tufts Hillel. Activities at Chabad include lively and intellectual discussions with the Sinai Scholars and Chillin' with Teffilin. Similarly, Tufts Hillel is affiliated with student organizations such as Jewish Women at Tufts and the Interfaith Committee. Hillel initiatives focus on social justice and educational topics, and range from Read by the River to Shir Appeal. Unlike other Ivy League schools, Cornell is a federal land-grant institution in New York. Therefore, the school prioritizes public engagement in an effort to improve the quality of life for local and national citizens. Between the Roitman Chabad Center, the Cornell Hillel and a dedicated residence hall with its own programming board, Jewish students at Cornell have no shortage of activities in which to broaden their scope of Jewish life on campus. Of the approximately 3,500 Jewish students on campus, 3,000 are undergraduates. In total, Jewish students make up about 30% of the Cornell student body. Jewish interest groups for grad students include the Jewish Business Association and the Jewish Law Student Association. Haverford College operates on a small, suburban campus outside of Philadelphia and is committed to imparting students with a liberal arts education in the broadest sense. Part of the Tri-College Consortium that includes Bryn Mawr College and Swarthmore College, Haverford welcomes Jewish students at the Bi-College Hillel, which is shared with Bryn Mawr. Jewish students account for about 25% of the approximately 1,100 students at Haverford. Both the Hillel, known as the Jewish Student Union, along with the Chabad House, are located on campus and feature programs such as Friday night Shabbat dinners and special events for holidays. Nestled in the Champlain Valley in Vermont, Middlebury College sits on a mostly rural campus throughout 350 acres. Ranked the No. 7 national liberal arts college, Middlebury prides itself on providing students with a classic liberal arts education. Middlebury College Hillel operates to promote Jewish life on campus by holding open discussions on contemporary Jewish issues, practicing traditions and coordinating social events in order to foster a stronger Jewish community. In addition, Middlebury hosts a J Street U chapter that brings students together to discuss potential strategies for achieving peace, strengthening security and promoting social justice in Israel. The nation's oldest Catholic and Jesuit university overlooks the Potomac River in Washington, DC, and, since its founding in 1789, has become a leading academic and research institute. Georgetown is known for its excellence in education and has highly ranked schools of business, law and medicine. Jewish students at Georgetown are estimated to account for 8% to 10% of the population and make up a vibrant Jewish community. With four student groups dedicated to Jewish issues, a Hillel-affiliated organization called Jewish Chaplaincy and an on-campus center and Bayit, the university has plenty of opportunities for involvement in Jewish life. Years after penning the Declaration of Independence, Thomas Jefferson went on to found the University of Virginia. Fellow founding fathers James Madison and James Monroe were also present when the school's cornerstone was laid in 1817. Today, the University of Virginia is a public institution committed to preserving its small, liberal arts atmosphere. Building on UVA's tradition of leadership, the Brody Jewish Center is dedicated to empowering Jewish students to inspire a lifelong commitment to the greater Jewish community. Weekly Shabbat dinners hosted at the Brody Center usually average 100 student attendees, while other activities include interfaith dialogues, volunteering events and Birthright trips. Part of the Claremont Colleges consortium, Claremont McKenna is modeled after England's Oxford/Cambridge style of shared university resources and is known for its premier liberal arts education. Jewish students at Claremont McKenna are welcomed at the Hillel at the Claremont Colleges. In addition to weekly social events, students at Hillel can participate in Tzedek, or social justice, and service projects, such as events in association with Hunger Awareness Week and alternative spring breaks. First Year Students at Hillel is a group that welcomes freshman at Claremont McKenna with social get-togethers like Lox and Lazer Tag. Centered on the San Francisco Bay, UC-Berkeley was dubbed the "City of Learning" after its founding in 1868. About 36,000 undergraduate and graduate students attend the school. Jewish students at Berkeley have dozens of opportunities to participate in Jewish life on campus. Students hungry for a taste of home can stop by the Rohr Chabad Jewish Student Center for a weekly Shabbat meal or Berkeley Hillel's famous weekly barbecue. Berkeley's Jewish Student Union is committed to unifying Jewish student group efforts and creating a forum for communication. Member groups include the Berkeley Jewish Journal, Tikvah: Students for Israel and Q-Jew, a group for individuals who identify with the Jewish and LGBT communities. University of Southern California is a private, not-for-profit research institute with more international students than any other U.S. university. Hillel at USC welcomes Jewish students to USC by creating a space to explore their Jewish identities, allowing them to engage with Israel, and offering community service opportunities. Ongoing events at Hillel include Jewish learning and study group sessions, bagel breaks and yoga. The organization also facilitates alternative spring breaks and Birthright trips to Israel. Similarly, the Rohr Chabad Jewish Center at USC provides much more than weekly Shabbat dinners. Chabad programming includes learning opportunities that further cultural and spiritual exploration for Jewish students. The U.S. News and World Report consistently ranks the University of Michigan in its list of top 10 public institutions. Sometimes called a "public ivy," Michigan students not only receive a premier education, but they can also experience Ann Arbor, one of the best college towns in the nation. Jewish life at Michigan is centered at the university's Hillel, which is affiliated with more than 40 student organizations. In addition to religious and cultural groups, Michigan has Hillel-affiliated groups dedicated to dialogues and forums, community outreach projects, social justice issues and environmental programs. Additional ongoing events, including the Torah enrichment program, are available at Michigan's Chabad of Ann Arbor. Carnegie Mellon is known for its academic programs in science, technology and computer science. CMU's approximately 550 Jewish undergraduates are encouraged to visit the Hillel Jewish University Center of Pittsburgh, which also serves students from the University of Pittsburgh and Duquesne University. Affiliated student groups include Chabad of CMU, Tartans for Israel and the Hebrew and American pop a cappella group VoKols. The Chabad of CMU leads Shabbat dinners, cultural learning experiences and social service projects. A small liberal arts college located in suburban North Carolina, Davidson College offers more than 20 undergraduate majors and competes in 21 sports at the NCAA Division I level. In 2007, the college replaced all loans with grants, allowing students to graduate debt-free. Under the umbrella of North Carolina Hillel, Davidson College Hillel celebrates major Jewish holidays with events like Salsa and the Sukkah and the Pizza in the Hut meal. Jewish students are welcome to participate in regular monthly events, as well as weekly Shabbat services held on campus. Borrowing a line from Socrates, the Hamilton College motto is "know thyself." Building on that principle, the school emphasizes a well-rounded liberal arts education that teaches students how to think for themselves. Hamilton Hillel is the college's official Jewish student group that provides a platform for students to explore their religious and cultural identities through social events, interfaith activities and Birthright trips to Israel. At close to 30 active Hillel members, Hamilton's organized Jewish community on campus continues to grow each year. While historically a women's college, Vassar became the first of the Seven Sisters (notable women's schools in the Northeast) to admit men. Today, the school is known for its innovative curricula and its picturesque campus. The hub for Jewish life on campus is the Vassar Jewish Union, a Hillel-affiliated, non-partisan organization that does not advocate any particular political opinion. Aiming to adopt a more pluralistic approach to issues surrounding Israel, Vassar Jewish Union does not endorse a political view and will not exclude groups or speakers based on political affiliations. In addition to Friday night Shabbat services, the Jewish Union leads social and educational programs such as inter-religious forums, game nights and bagel brunches. Set against a charming New England backdrop, Wesleyan University offers 44 major fields of study and about 200 organizations for its approximately 3,000 students. The 600-700 Jewish undergraduates at Wesleyan are welcome to visit the school's Bayit for weekly Shabbat dinner and prayer. The Bayit is the headquarters for Jewish life on campus, and, with a full Kosher kitchen and common area, Bayit also serves as housing for about 20 students. Wesleyan has a strong partnership with the national Hillel organization and often sends students to participate in off-campus programs or conferences. Embracing the school's tradition of activism, some Jewish students participate in groups like WesShalom, The Third Path and Kol Israel, which focuses on political issues facing Israel. Known for shaping young women's minds for the past 100 years, Wellesley College is a liberal arts school with a teacher to student ratio of 1:7 and an enrollment of about 2,300. Wellesley College Hillel is the main Jewish student organization on campus and offers religious, social and educational programs for both Jewish and non-Jewish students. The entire college community is encouraged to celebrate Jewish holidays at Wellesley Hillel, as well as other programs such as home-stays with Jewish Wellesley alumnae, baking cookies for the homeless and religious discussion groups. Offering more than 50 fields of study throughout eight schools and colleges, Boston College has been committed to teaching and research since its 1863 founding by the Society of Jesus. Today, the private Catholic institution located in a Boston suburb has an undergraduate enrollment of about 9,000. Jewish undergraduates are estimated to make up about 2% of the population and have created their own niche on campus. The Boston College Hillel provides social, cultural and religious events for all students, such as Shabbat dinners and holiday events. As a public ivy, the second oldest college in the U.S. has a long history of providing a leading liberal arts education, with a growing emphasis on science and research. The Jewish community at William and Mary is headquartered at Balfour Hillel, an organization committed to enriching the lives of both Jewish undergraduates and graduate students. In addition to Friday night Shabbat dinners and services, students at Hillel can join weekly Lunch 'n Learn sessions with Rabbi Litt and participate in Birthright trips to Israel. For law students, there's also the Jewish Law Students Association, which brings students together to celebrate the holidays. Due to its strong partnership with Columbia University, women at Barnard College get the best of both worlds: the atmosphere and education of a small liberal arts school, and opportunities for collaboration in academics, sports and clubs at an Ivy League institution. Jewish students at Barnard are welcome to check out the Columbia/Barnard Hillel. Hillel-affiliated student groups focus on Jewish culture, education, social justice and political issues surrounding Israel. The Kraft Center houses Hillel and serves as the center for Jewish life on campus. Brandeis, a private research university with a focus on liberal arts, is the only nonsectarian, Jewish-sponsored college or university in the U.S. It's estimated that about half of the undergraduates at Brandeis are Jewish, and their numbers are reflected in the wide range of student groups associated with Jewish life and culture. From Yiddish Club, to Chalav U'Dvash, a journal of Zionist thought, to B'yachad, an Israeli folk dance troupe, Jewish students have plenty of organizations in which to participate. In addition to the many groups, Jewish students will find weekly and monthly events at Hillel at Brandeis and The Chabad House. Hillel's Friday night dinners and services bring in about 400 students each week. Named for both George Washington and Robert E. Lee, Washington and Lee University brings students a 21st century liberal arts education that provides graduates with the ability to think freely and critically. Hillel at Washington and Lee is the center for organized Jewish life on campus. It's dedicated to community service, Jewish learning and supporting Israel. In addition to weekly services and holiday celebrations, past events at Hillel include the Great Latke-Hamentashen Debate, Sunday night football parties and Lunch and Learns that explore Jewish thought. As a private liberal arts school, students at Colgate can choose from more than 50 majors offered in one of four areas: humanities, natural sciences and mathematics, social sciences and university studies. The Colgate Jewish Union is the on-campus center for Jewish life and facilitates Shabbat services and holiday celebrations. Other student-led groups include the Blue Diamond Society, a Jewish men's group that participates in cultural and social events; Israel Culture Club, which coordinates speaking engagements that promote Israel's heritage; and Challah for Hunger, a group that bakes and sells challah and then donates the proceeds. Recognized as a leading liberal arts school and healthcare system in the Southeast, Emory places priority on both teaching and research. Jewish students make up about 23% of undergraduates at Emory, and they are welcome to participate in programs and services at the Marcus Hillel Center and the Chabad House on campus. Programs at Emory's Hillel underscore the organization's five pillars of Jewish life: Jewish learning, Israeli experience, social justice, community building and leadership development. Student groups affiliated with Hillel range from Chevrutah, which organizes open-ended Jewish learning sessions and discussions, to Jbiz Roundtable, a program that connects students interested in business to corporate executives within Atlanta and beyond. Over its nearly 100 years, UCLA has made a name for itself as a progressive, public, research institute. With more than half of its students graduating with research experience in humanities, social sciences and STEM fields, it's no surprise UCLA faculty and alumni are credited with major science and tech contributions. Through religious services and associated student groups, Hillel at UCLA provides something for everyone seeking to participate in the on-campus Jewish community. Student groups include greek-focused organizations such as Alpha Epsilon Pi, a Jewish fraternity, as well as advocacy groups like J Street U at UCLA, which promotes support for Israel. Chartered in 1789, the University of North Carolina is the nation's first public university. Today, with a total undergraduate enrollment of about 18,000, UNC ranks among the top U.S. universities in research support. Jewish students at UNC-Chapel Hill make up about 5% of the student body, at 950 Jewish undergraduates and 350 graduate students. One of the most celebrated Jewish events on campus is the weekly Shabbat dinner and services held at UNC-CH Hillel. Three student-led services are held: Reform, Conservative and Alternative Discussion, followed by a Kosher dinner. Hillel-affiliated student committees range from the Holocaust Education Project to the Tzedek Committee, which is focused on social justice programs. With 16 different colleges and more than 150 research centers and institutions, the University of Florida boasts a diverse academic curricula for its nearly 50,000 students. Striving to make Judaism relevant and accessible for Jewish students, UF Hillel offers religious, educational and social programs. The organization's Innovation Space, which features a full-length green screen and a lounge with wi-fi access, is just one more example of the Hillel's dedication to bringing Jewish students together. Putting a twist on a weekly tradition, UF Hillel introduced Food Truck Friday and now brings Shabbat dinners to students. Structured on a block plan where students take one three-and-a-half week class at a time, Colorado College facilitates its liberal arts education by fostering an intimate learning environment that emphasizes hands-on fieldwork and plenty of in-class discussions. The Jewish social organization at Colorado College is the Hillel/Chaverim; chaverim means "friends" in Hebrew. With Jewish students making up about 5% of enrollment, typical turnout for Hillel/Chaverim events is about 15-30 students on average. In addition to weekly Shabbat dinners, students at Hillel/Chaverim can participate in a range of activities from volunteering at animal shelters to helping out with the latke cook-off during the Hanukkah party.